Intel has announced a major innovation in microprocessors this week: the world's first 3D transistors, called Tri-Gate, which will be used in the corporation's next generation of desktop, laptop and mobile chips. It means that - for the first time since the invention of silicon transistors over 50 years ago - transistors using a three-dimensional structure will be manufactured in volume, used inside Intel chips later this year. First invented by Intel research scientists in 2002, Tri-Gate is a new way of manufacturing transistors that the corporation will introduce with its move to 22nm logic technology late in 2011. And, what's more, they bring a whole new dimension to proceedings; the three-dimensional Tri-Gate transistors represent a fundamental departure from the two-dimensional planar transistor structure that has powered all consumer electronics devices to date. The Tri-Gate transistor is so named as the gate has three sides. 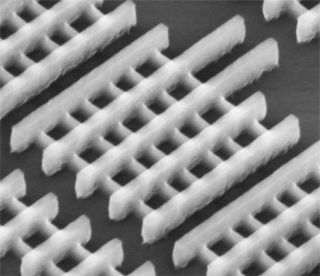 The traditional 'flat' two-dimensional planar gate is replaced with an incredibly thin three-dimensional silicon fin that rises up vertically from the silicon substrate. Control of current is accomplished by implementing a gate on each of the three sides of the fin – two on each side and one across the top - rather than just one on top, as is the case with the 2D planar transistor. And since these fins are vertical, transistors can be packed closer together. Without the new transistors, it would have been difficult for Intel to continue to uphold Moore's Law. This is the 1965 theory by Intel co-founder Gordon Moore that the number of transistors in a given area would double every two years, with increased functionality and reduced cost. Intel says its scientists have long recognised the benefits of a 3D structure for sustaining the pace of Moore's Law as device dimensions become so small that physical laws become barriers to advancement – as process technology has got smaller, problems such as current leakage have needed to be dealt with. "For years we have seen limits to how small transistors can get," said Moore of Intel's latest innovation. "This change in the basic structure is a truly revolutionary approach, and one that should allow Moore's Law, and the historic pace of innovation, to continue." Intel says there's a "dramatic performance gain at low operating voltage" – thanks to far reduced current leakage. Indeed this translates to a 37 per cent performance increase at low voltage versus Intel's 32nm planar transistors and under a 50 per cent power reduction with constant performance. Basically, the new transistors consume less than half the power when at the same performance as 2D planar transistors on 32nm chips. Better control over the transistor gate enables as much transistor current flowing as possible when the transistor is in the 'on' state for performance, and as close to zero as possible when it is in the 'off' state to reduce power. The new transistors will also have better ability to be turned on and off to save power when they're not needed. When will Tri-Gate transistors be announced? We'll start to see 22nm processors appear later in the year – and the process will supecede the current Sandy Bridge processors in due course. This keeps on track Intel's plan to introduce a completely new processor generation every two years. Intel has already demonstrated a 22nm chip codenamed Ivy Bridge – the corporation has also said they will continue to use the Intel Core branding for desktop and laptop chips as well as Atom for handhelds and other mobile devices. Tri-Gate replaces the High-k Metal Gate transistors announced alongside the move to 45nm in 2007. Each 22nm processor will have somewhere in the region of 2.9 billion transistors on board. More than 6 million 22nm Tri-Gate transistors could fit into the space taken up by the full stop at the end of this sentence. What devices will 22nm be used in? As well as servers, desktops and laptops, Intel says 22nm is poised to take a hold in the mobile device market. "The low-voltage and low-power benefits far exceed what we typically see from one process generation to the next," says Intel Senior Fellow Mark Bohr. "It will give product designers the flexibility to make current devices smarter and wholly new ones possible. We believe this breakthrough will extend Intel's lead even further over the rest of the semiconductor industry." Will the new 22nm processors cost more? In its documentation Intel says the new manufacturing process costs around 2-3 per cent more, but we wouldn't expect this to mean anything by the time it gets inside your next PC, Mac or tablet.